Ava's Keyblade is the default form of Ava's Keyblade that appears in Kingdom Hearts χ and Kingdom Hearts Union χ.
Ava's Keyblade is unique among the Foretellers' Keyblades in form, lacking a large, engraved dark portion on its shaft. It features many gradients of pastel tones. It has a long, gold handle. The guard has long, cloud or wave-shaped portions shifting from yellow to blue on the top and separate blue pieces by the pommel. The base features a gold fox with teal eyes set atop an intricate gold and pink etching. A few cloud-like golden parts are above it to either side. 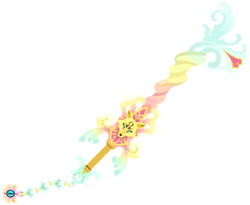 The shaft is twisted and pink, then yellow, then blue. The blue bursts into separate clouds which form the teeth. Set in the center of the teeth, perpendicular to the shaft, is a pink symbol resembling Terra's Mark outlined in gold. The Keychain matches the blue parts of the blade, while the token is yellow and pink, inset with a Gazing Eye. Concept art of Ava's Keyblade.